Jack Rosenthal’s BAFTA-nominated screenplay of The Knowledge was a gem of a 1970’s television movie. The most routine facets of life, in Rosenthal’s hands, could become perfectly portrayed vignettes, as he transformed the recognisable into the bitter-sweet hilarious. The titular knowledge is famously what is required to become a licensed London black-cab driver, a process so demanding that 70% of hopeful candidates fail to make the grade. This is hardly surprising as those who pass will, over a period of a year or two (that is, for the fast learners) have committed to memory the nigh on 15,000 streets that sit within a 6 mile radius of Charing Cross. Of equal importance, they will also have convinced their examiner that they have the patience and strength of character to deal with the full range of humanity that could, at any point in time, end up in the back of their cab. Rosenthal’s genius lay in not only recognising that “doing” the knowledge was a massive feat of memory, but that it also impacted upon the would-be cabbies’ domestic lives. Above all, within his cast, Rosenthal created the most brilliantly tyrannical of examiners in Mr Burgess. A finely scripted, complex character, capable of the most sadistic of pedantries yet also, ultimately, caring for the overall good of the taxi trade. Mr Burgess ranks alongside some of that decade's finest dramatic creations. Remember too that the original screenplay was written at a time when the internet (let alone Uber) was barely heard of. There is much talk today of the cheaper and far less regulated online service threatening the licensed cab trade. Those fears are probably valid and with this adaptation, The Knowledge does a fine job in reminding us of the asset London has in it’s black-cab drivers. The play is directed by Maureen Lipman who not only featured in the 1979 film, but was married to Rosenthal until his untimely death in 2004 and rarely has a task been undertaken that is such a labour of love. Lipman makes a decent job of her late-husband’s material, supported by a strong cast of well fleshed out caricatures. James Alexandreou puts in a strong turn as a feckless womanizer, caring as little for wife Brenda (Celine Abrahams, in the role played on TV by Lipman) as he does for his taxi studies. Fabian Frankel is a well acted Chris – an intellectually challenged young lad who struggles with the gargantuan task of mastering London’s geography. Famously, Rosenthal had an innate understanding of the Jewish community, many of whom work in the taxi trade. Ben Caplan’s Ted , a third generation cabby captures both the man’s passion as well as his nebbish qualities in equal measure – though it is Jenna Augen as his wife Val, who so brilliantly nails the angst-ridden Jewish mother and wife. Lipman played a memorably interfering Jewish matriarch “Beattie”, in a 1980s ad campaign for BT. With Rosenthal’s creation of Val, one can see from where she may have drawn her inspiration. The finest contribution of the night comes from Steven Pacey’s Burgess. It was Nigel Hawthorne who played the role in 1979 (with ITV’s The Knowledge just preceding the BBC’s Yes, Minister onto the nation’s TV screens). Pacey thus has massive shoes to fill and he makes the role his own. 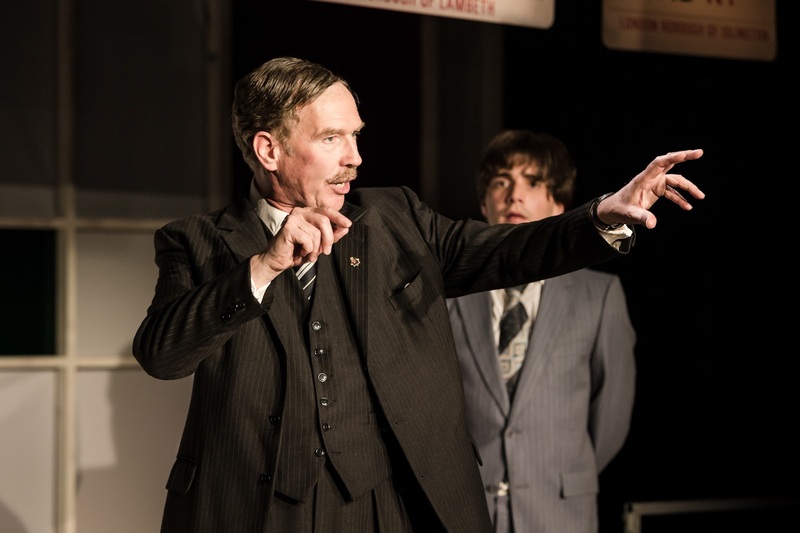 Onstage throughout – on a raised platform representing his office, a device that proves surprisingly effective - he delivers a vocal wit and physical presence that convinces us at all times of his compassionate power over the fledgling drivers. For the most part the evening is a warm and entertaining night out. The politics may be mild and dated, but the fondness that Rosenthal (a Mancunian by birth) felt towards his capital city is there in every line. The Knowledge is a gorgeous period piece with a lavish programme (highly recommended) that is chock full of recollections and current day comparisons. If you love Seventies culture, you’ll love this show.